Sometimes acrylic breaks. It can be fragile when bent and accidents happen. If you get a break in your Wild Gears it can be repaired. This method works best if the broken piece has a break in it rather than being broken into multiple pieces. The glue to use is acrylic cement, or superglue should work well too. Use a toothpick or pin to apply a small amount of the glue to the broken face. Then align the break into the flat position you want the glue to cure it. Wipe off any extra glue. Some tape can help hold the pieces together nicely. Read the glue container to learn how long it should take for the glue to set. Be careful not to glue your piece to whatever surface you are working on, like your table, or to yourself. This fix should make the piece usable again but there will be a visible mark where it was broken and glued. Good luck in your mending! Today'll be a quick post about what all the different numbers on the gears mean. Most gears have two sets of numbers and non-circular gears have three sets. The biggest number is the tooth count of the gear. This is a measure of the circumference and is helpful to know when making design choices. Most gears also list the prime factors of the tooth count. Prime factors help predict how many lobes/petals/points a design will have. 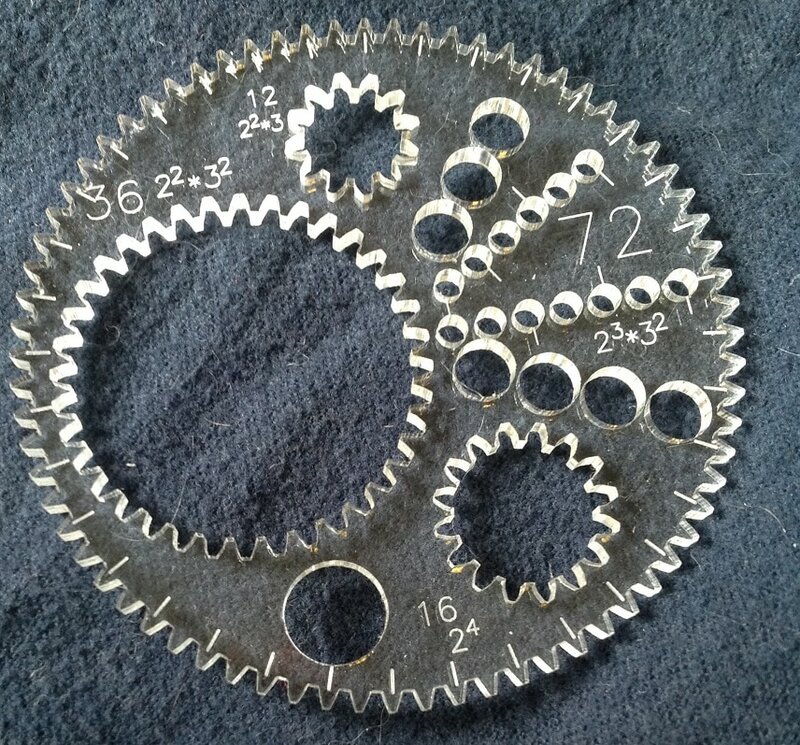 In the picture above the tooth count of the gear is 135 and the prime factors are 3^3*5 (3*3*3*5). Some small gears have the tooth count as their only number due to space constraints. Prime factors will still be listed where the number is engraved beside the ring. Some gears have a prime number of teeth and therefor don't have any factors to list. 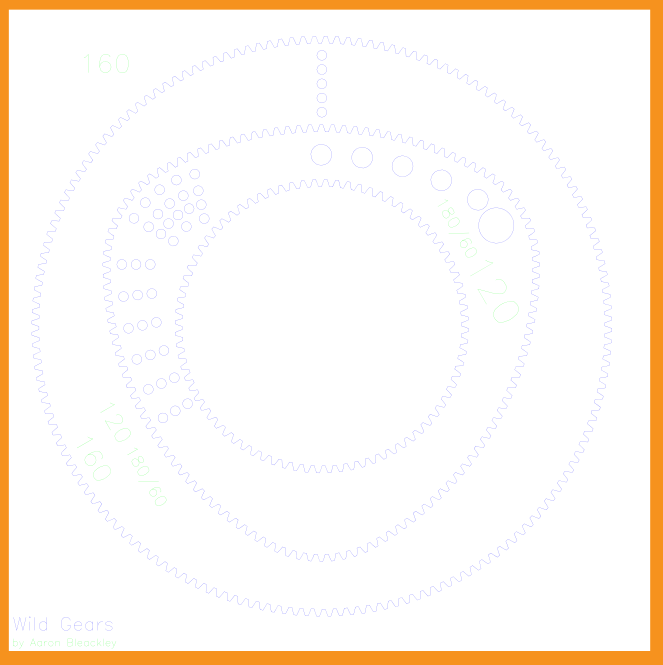 The numbers on the non-circular gears will be written as 'big number / small number' ( 120/24 for example). These numbers tell you about the different parts of the non-circular gears. 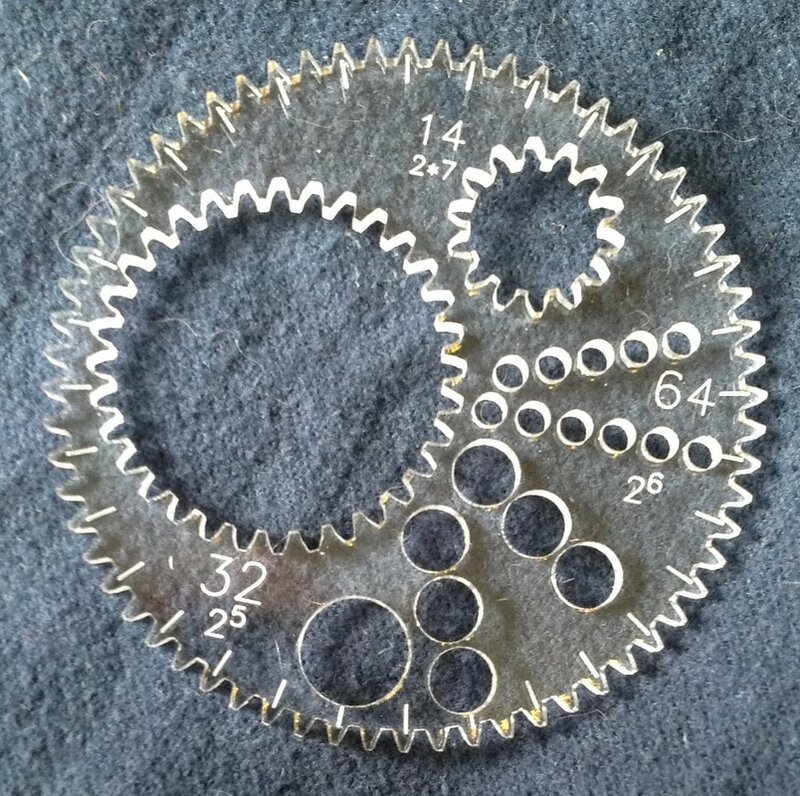 These gears are constructed from arc-segments of different sized circular gears. 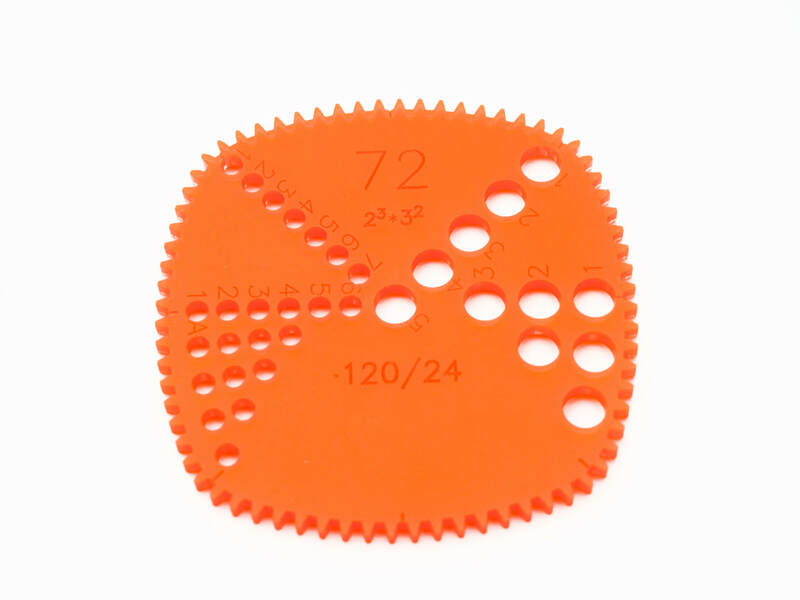 A triangular gear that was 120/24 means that the flat 'sides' are made from part of a 120 tooth gear and the corners are made from part of an 24tooth gear. This is important to know because the resulting triangle gear will not work properly in a ring that is smaller than 120 teeth and the triangle ring will only work with gears that have fewer than 24 teeth (bigger ones will get stuck in the corners). There is also hoops which have an inside and outside tooth count. In the picture above the outside of the hoop has 210 teeth and the inside has 180 teeth. The prime factors of each are listed beside. On some hoops the tooth counts will be listed separated by a slash (210/180) due to limited space. 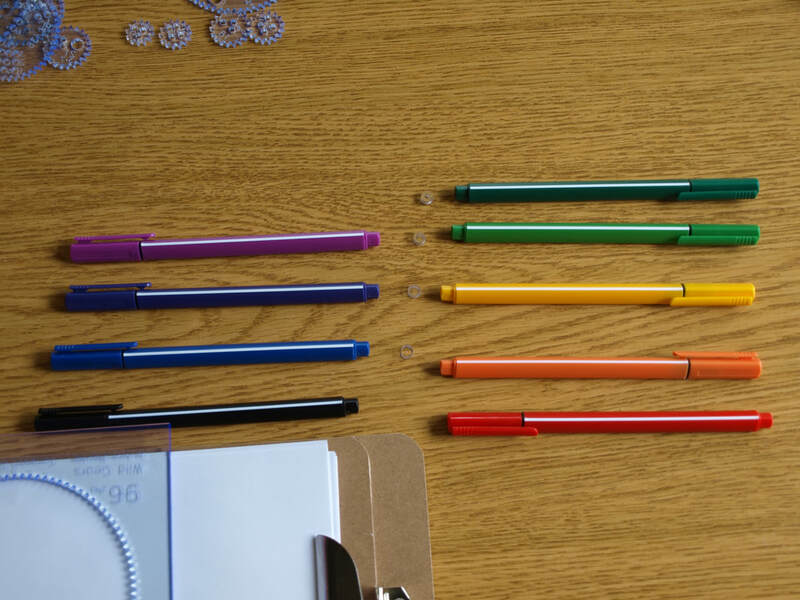 Pen holes come in 4 sizes: small, medium, large, and extra small. 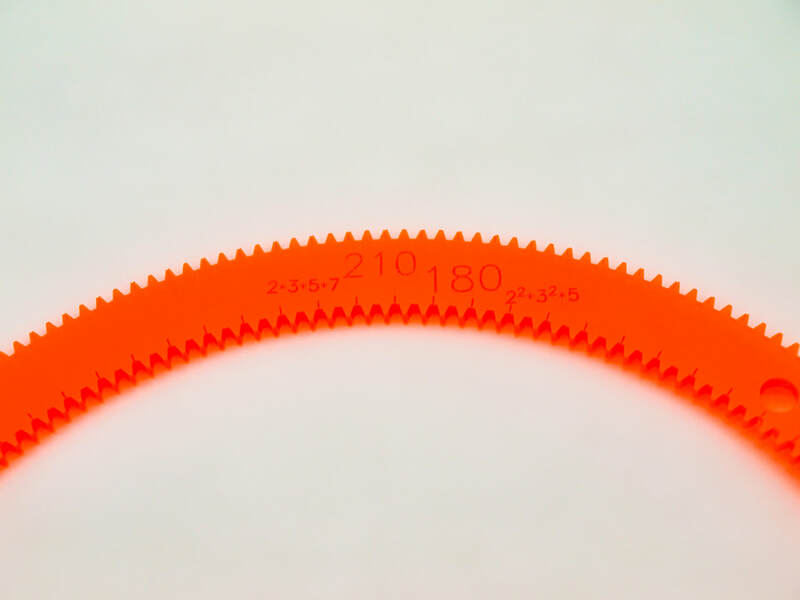 Small pen holes are on every gear and have a diameter of 3 mm, medium pen holes are on most gears and have a diameter of 6 mm, large pen holes are on some gears and have a diameter of 9 mm, and extra small pen holes are rarely seen on very specific gears and have a diameter of 1 mm. Each line of pen holes is numbered starting at 1 at the edge of the gear and counting up until the line ends. Lines of the same size are marked with A, then B, and so on. Line A starts closer to the edge of the gear than line B. The distance between A1, B1, and A2 are the same; this allows placing more equally spaced pen holes on the gear than one line could hold. Non-circular gears also have 'side' and 'corner' pen holes to distinguish between. Note: These are version 2 Strange Shapes Gear Sets (V3 is current). 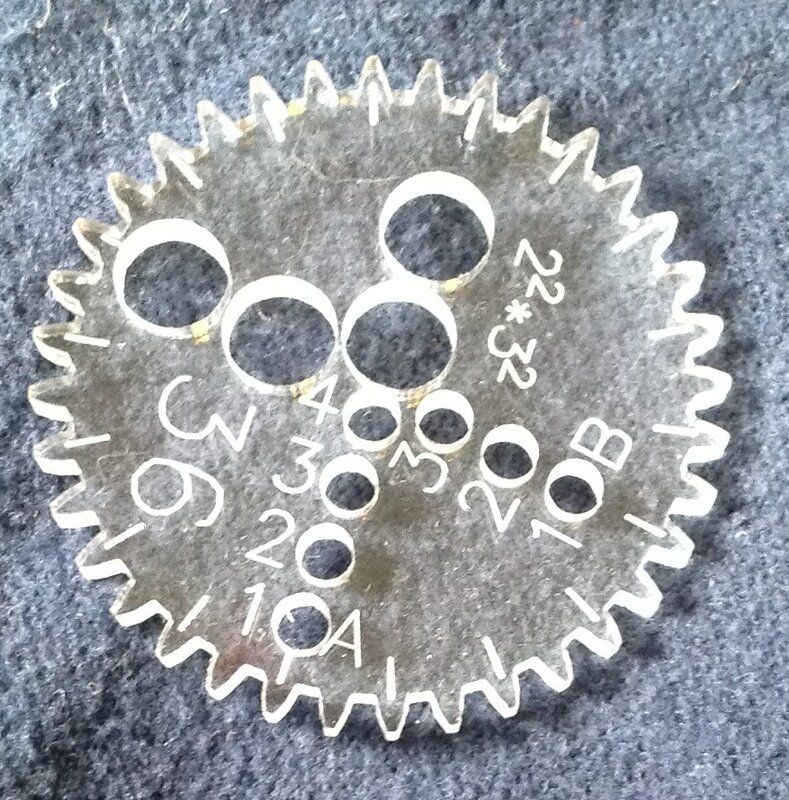 They have all the same parts but lack the hatch marks around the edges of the gears as well as the numbered pen holes and the prime factors listed on each piece. The gear set in the picture has had some of the brown paper layer removed from one side to make the pieces stand out better. I often get asked about how to store and organize wild gears; especially the large sets. There are many creative and wonderful ways that people have shared with me that they have come up with. Perhaps I'll collect some of them for another post in the future. But right now I want to tell you about the simplest storage solution that I have found. Pizza boxes. Wait, clean pizza boxes. The pizzeria down the street will sell me pizza boxes for $0.50 each. I got an extra large pizza box and it holds large gear sets very well. Large Gear Sets are 15 inches, and small gear sets are 7 inches. You can probably even get blank pizza boxes somewhere if you look around. Cardboard is light, durable, and easy to decorate. I like this solution, and will probably employ it for several of my gear sets because it lets me stack, label, and organize things and I really like the low profile boxes for not taking up more space than is needed. Bonus cat (Echo) for scale. Echo was being very sweet as I shared her spot in the sun for this photo. Hello Wild Gears Fans!This has been a busy, hectic week for me but I got the Kickstarter page done. It turns out that Kickstarter has a review process that is either new, or I totally forgot about. It takes up to 3 days so I might not be able to launch the campaign until the 14th. I'm pretty sure that I can still make edits to the campaign while waiting for the review so if you have any suggestions I'd love to hear them so that I can make this even better before it launches. I'll definitely be giving the page a once over this weekend to find things to tighten up and improve. The plan is to launch as soon as I get the review done (sometime on the 14th). I'll send out another quick note when that happens. Today I want to give you some initial details about the upcoming Wild Gears Kickstarter and some of the new features that are in development. I have set an ambitious goal to launch Wild Gears Kickstarter by the end of next week. I am going to try my best to hit that goal but only time will tell. Wild Gears 3.0 Kickstarter will be raising funds to allow for another round of improvement on existing gear set designs as well as launching some new gear sets. Wild Gears is continuing to grow and I hope that in the future general sales of Wild Gears will support ongoing development and improvement but it isn't there yet so I will once more turn to crowd funding and enthusiasm to help improve and expand on Wild Gears. Initial work on the Compact Gear Set has been prototyped to test out different design changes and improvements. I am very happy with how well this initial round of prototyping has gone and in working with it I've discovered more improvements that I want to implement. Adding prime factors to all the gears and rings. 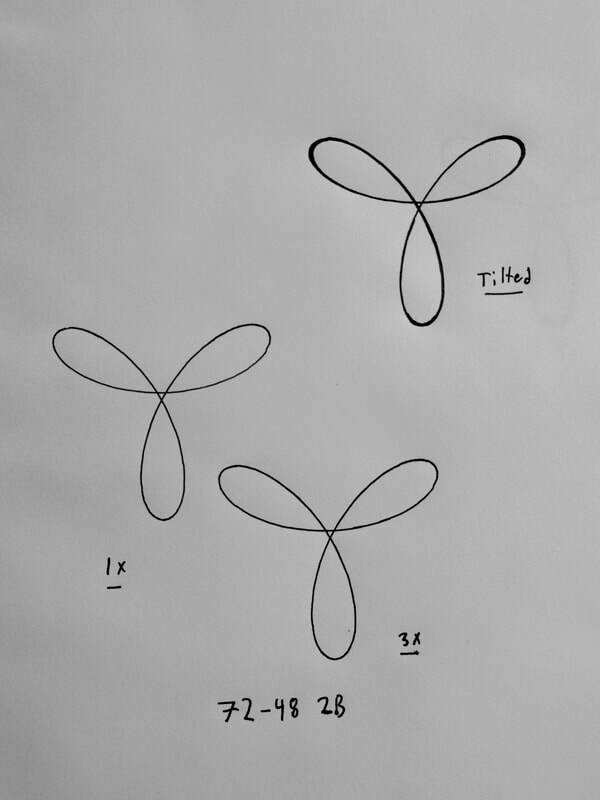 Prime factors are helpful in determining how many lobes, or petals, the design will have. Adding tick marks to the gear and ring sides of each cut. Current prototype has tick marks on the gears but not the rings and I like the effect but look forward to the next iteration with marks on both sides. These tick marks are to help counting gear teeth when shifting the pieces. Other improvements are under investigation but are not certain if they will pan out as well as these first prototyped improvements. Putting tiny marks on the parallel line 'doughnut' pieces so they are easier to tell apart. This one was hard to photograph as it is so small. Marking the pen holes to make them easier to use. Currently the pros and cons of alternating tick marks vs. Tiny numbers is being weighed. Little errors on some of the gear sets will be corrected; a misplaced pen hole, a missing gear set name, or a thin weak section of a part will be thickened. A new type or 'size' of gear set will be introduced. I currently call them Adjunct Gear Sets but may select a better title for the Kickstarter launch. Adjunct Gear Set are the same size as Small Gear Sets and explore a small theme. 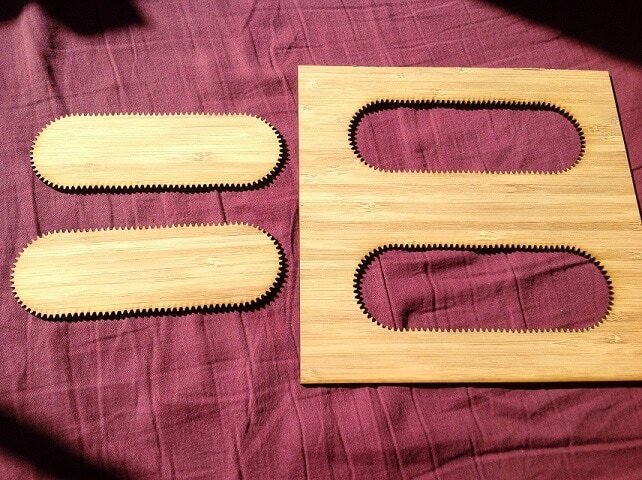 The two Adjunct Gear Sets that are in development are the Triangle Hoop and Ruler gear sets. 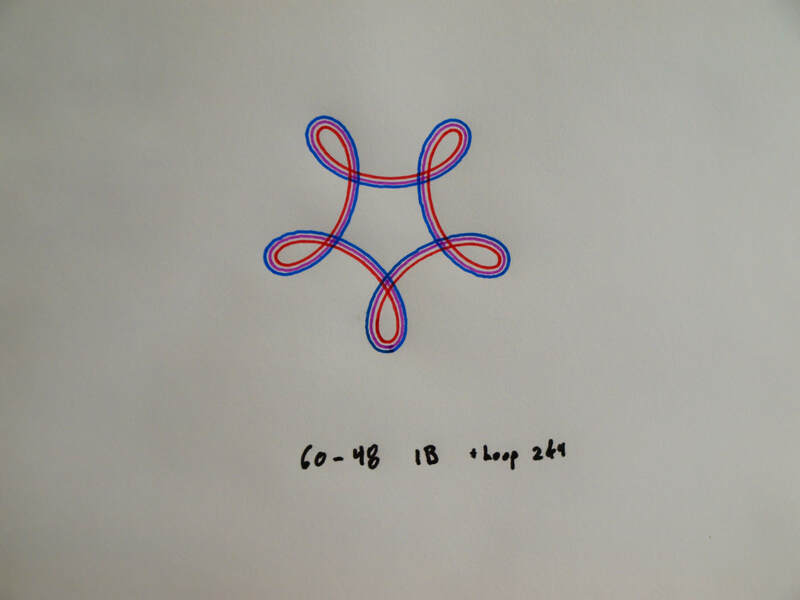 The Triangle Hoop Gear Set explores adding a triangular gear into a set of rings so that one can explore 3 gear systems with a non-circular gear in the mix. The Ruler Gear Set is two almost strait ruler like pieces. They have a slight wave to them to keep it interesting. Also, yes these prototypes are cut from wood. It is a beautiful option that I am exploring the durability of. Due to their simpler design and less laser cutting required the adjunct gear sets will be less expensive than Small Gear Sets. The Wild Gears Kickstarter will feature some new gear set options available as part of the base funding goal or as a stretch goal. Adding new gear sets as a stretch goal has a few desirable features from a designer point of view. My main goal of this Kickstarter campaign is to cover the majority of the prototyping costs for the new version of Wild Gears. I have a good handle on how much that is likely to cost so I can make an ambitiously low funding goal which increases my odds of raising the funds. Making new Gear Sets is more uncertain and takes more iterations on the initial prototype so it costs more and has more uncertainty. Both of those traits require raising more funds. The reason I am pushing to launch the Kickstarter campaign for next week is that I want to be able to deliver the backer rewards in time for Christmas and working that time line backwards means that I have enough time to complete the project if I start very soon. I could delay by a few weeks but that would cut into the number of rounds of revision I would be able to do. I don't want to rush the design and improvements so I'm buckling down now to get this show on the road. As with the Wild Gears 2.0 kickstarter all backer rewards will be offered at some discount below regular price. There will also be a limited number of early bird backer spaces that will offer a greater discount on all gear sets. No-matter when the Kickstarter launches I will send out a short newsletter the day before with launch details so that everyone who wants to get an early-bird pledge level can get one. 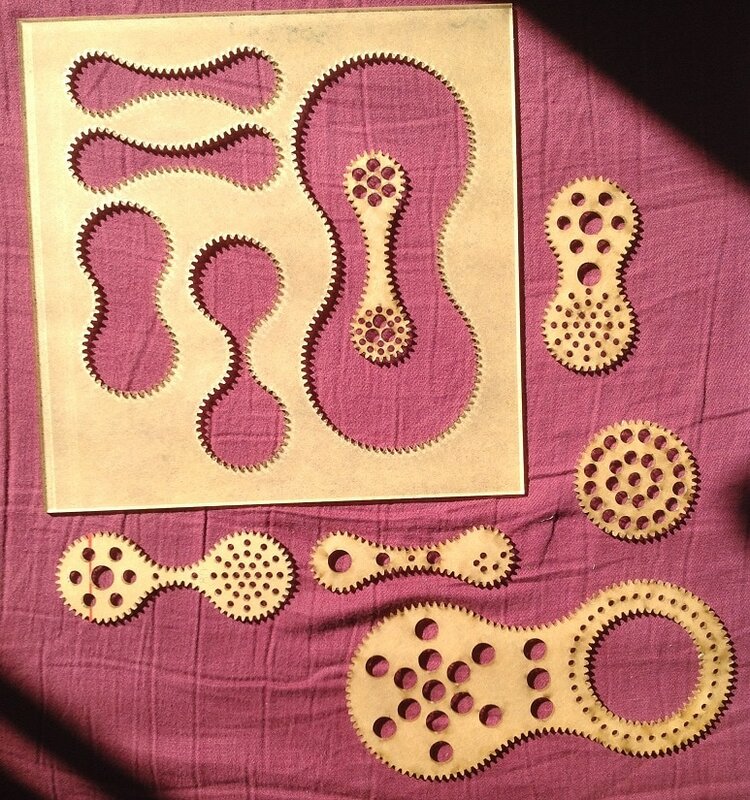 A gear set that explores the gear-in-gear variety by selecting one big gear ( like 120 teeth for example) and making many copies with different size gears cut out of it. I prototyped a cool looking 'Blobs' adjunct gear set. I think it has potential to be really cool to use. Currently it is impossible to use with existing techniques and I'm trying to figure out if there is any way to use it. More material options may be available. I experimented with two colour gold-black acrylic. It is gorgeous and shows the engraved writing very well. However it only comes in 1.5mm thickness so I'll have to test it a bunch as I anticipate that it'll be harder to use. If you have something to say, I'd love to hear from you. Now is the time for any suggestions or feedback to have an impact of the next version of Wild Gears. Thank-you for your ongoing interest in WIld Gears! The preparatory work for Wild Gears Kickstarter is underway. Some early prototypes of some of the improvements are being made right now. If everything comes together I'm planning on launching the campaign in 3 weeks. I'd like to tell you about some of the things I'm working on or planning. Wild Gears will get several features which will make the gears more usable. 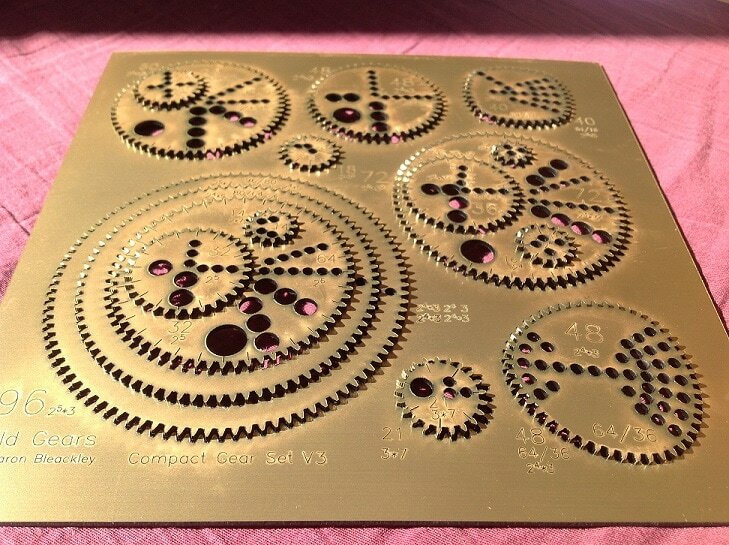 Features like: listing the prime factors on the gears along with the tooth count, including some sort of tick marks / ruler marks on the gear teeth to make it easier to count them, more legible numbering, and numbered pen holes. 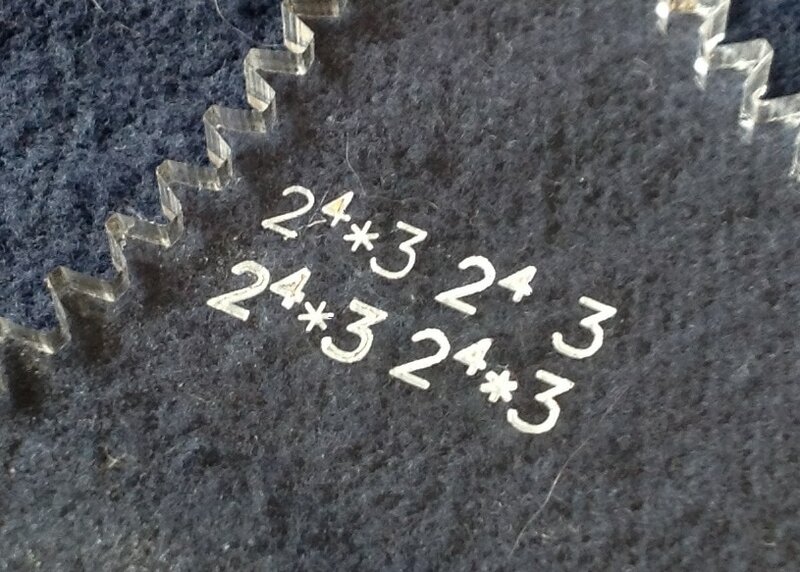 The factors are easy to add and I'm working on ways to engrave the numbers that make them easier to read on the clear acrylic. Adding more numbers to the gears makes it even more important that they are easy to read, which they currently aren't. 3 different possible improvements to the legibility are being prototyped. The counting marks around the gear took me a while to figure out a good balance where they were functional, not too fancy, not too expensive, and easy to use but I think I've got a handle on that. Initial tests explored 4 variations on complexity and styles. A relatively simple one won out and some tweaks to its appearance are being prototyped. The numbered pen holes are the number one most requested feature and I am having a hard time coming up with a solution that I like. The main problem is one of space. The pen holes are 3mm (about 1/8th of an inch) in diameter and close together. Even if I wanted to engrave a number beside each hole they would be too small to read easily. Also because the lines of holes converge towards the center of the gear there is even less space for numbers there so even if I could make tiny numbers that were legible they would be crowded out near the middle of the gear. Clearly a compromise is in order. But which one? I could put less stuff on each gear which would give more space for numbers but would mean that much less functionality and design space would be included in each gear set. I think that numbers are nice but not important enough to remove other useful features for. I could use some less complected system of visual cues to make it easy to count and track which pen hole you are looking at. I am currently prototyping a couple features to this end. If you have any suggestions on how to make it easy to visually determine one pen hole from another I'd love to hear your suggestions. 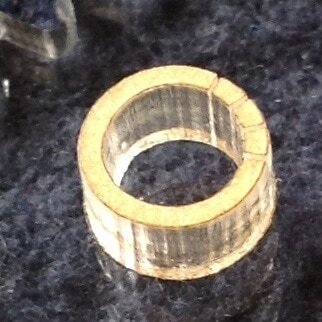 Pen holes will get lines that point to their corresponding gear tooth in cases where it is hard to tell for certain. The piece packing on the Modular Gear Set will be improved. Initial efforts suggest that I can fit at least 10% more pieces into that set. Other things I want to achieve with this kickstarter is to produce an 'idea book'. Many people have asked me for a companion document to go with Wild Gears to tell them how to use it to make designs. I want to make a document that will cover the details of how to use Wild Gears and how to have a sense of what sort of design you might get as well as different techniques and how they impact the art. I am picturing this process producing many short how to videos as I systematically work though the material. I am currently thinking of it as a technique manual that will enable informed creativity rather than a recipe book for use gear X and ring Y and pen holes 1, 4, 12 to make this specific thing although if the recipe book concept is widely wanted I will probably make something along those lines too. Have you come up with any cool ways of using Wild Gears that aren't represented in this list? If yes, please tell me! Or better yet, send me a picture or three. 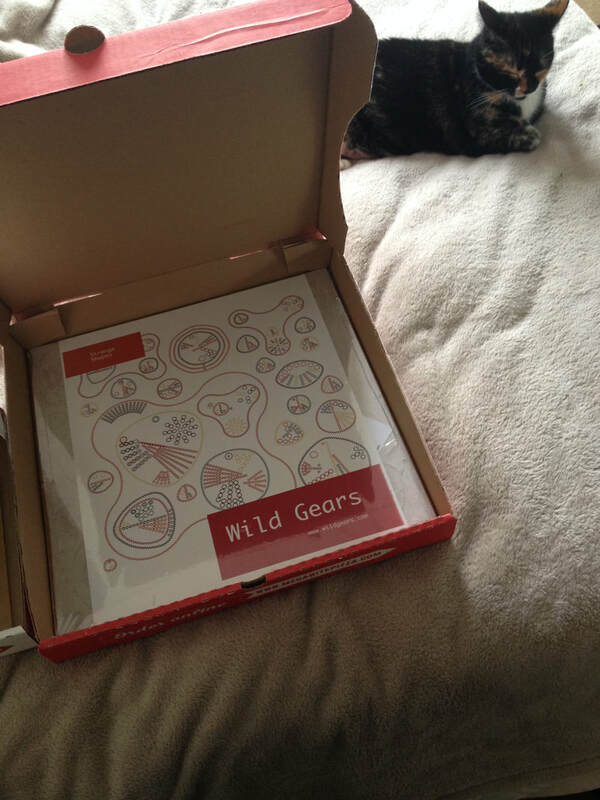 I also am intending to develop an educational Wild Gears bundle with a focus on educational usability. If you are interested in this aspect of the project (or know someone that would be) I am looking for a few educators to work with to make sure my ideas aren't too far off base. Wild Gears Newsletter #2 will include pictures to break up the enthusiastic wall of text and show off all the new prototype pieces.